Pro-life groups are criticizing former representative Robert Francis O'Rourke after he endorsed late-term abortion at an Ohio campaign rally. O'Rourke said he supports abortion in the third trimester of pregnancy when asked about the issue on Monday evening. "The question is about abortion and reproductive rights and my answer to you is that should be a decision that the woman makes. I trust her," O'Rourke said. Pro-life groups have begun speaking out against O'Rourke, a former three-term Texas congressman who lost a Senate race to Ted Cruz in November. Mallory Quigley, spokeswoman for the pro-life Susan B. Anthony List, said O'Rourke is just "another abortion extremist" in the Democratic field. "Beto cannot even say one point in pregnancy—or immediately after—when he would protect the life of an innocent child," Quigley said. "This radicalism is out of step with voters and even the Democrat party's own base." Multiple polls have shown that limits to late-term abortions are popular among the general public, a majority of Democrats, and even a large percentage of those who self-identify as pro-choice. 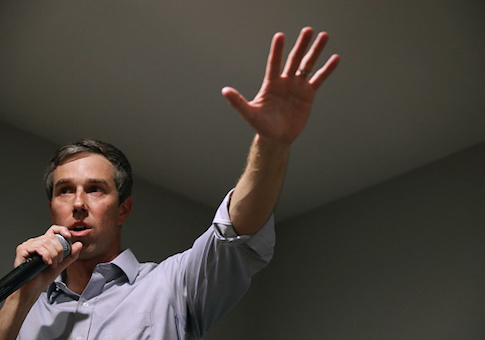 Maureen Ferguson, a senior policy adviser at the Catholic Association, said that O'Rourke and his fellow Democrats could alienate voters in a general election. She also emphasized that the abortions in question center on babies capable of living outside of the womb thanks to advances in medical care. "Cavalierly proclaiming support for third trimester abortion may be in vogue in today's Democratic primary for the 2020 candidates, but it's the wrong way to win a general election," Ferguson said. "It's also endorsing infanticide; a baby in the 7th, 8th and 9th month of pregnancy is viable and can live outside the womb." Terry Schilling, executive director of the American Principles Project, said O'Rourke's stance contradicts the "moderate" image he cultivated during his political career. Schilling was not surprised by O'Rourke's shift given the state of abortion politics among liberals and the Democratic base. The 2016 Democratic platform endorsed taxpayer-funded abortion for all Americans—a departure from previous years—but stopped short of opposing limits to late-term abortion. Schilling expects that to change in 2020. "Democrats are in a race to the bottom on abortion," Schilling said. "The party litmus test is now enthusiastic support for third-trimester abortions—and Beto just passed with flying colors." Late-term abortion has become a defining issue for Democratic presidential hopefuls in the wake of New York passing legislation that allows abortion up until the point of birth. A similar proposal in Virginia drew national attention when Democratic Gov. Ralph Northam told a local radio station that he supported the bill and indicated that babies who survive abortion can be allowed to die on the table if a mother wishes. O'Rourke's 2020 competitors, including Sens. Elizabeth Warren (D., Mass. ), Bernie Sanders (I., VT), Amy Klobuchar (D., Minn.), Cory Booker (D., N.J.), Kirsten Gillibrand (D., N.Y.), and Kamala Harris (D., Calif.), all voted against a bill that would ensure doctors provide care to such newborns. This entry was posted in Issues and tagged 2020 Election, Abortion, Beto O'Rourke. Bookmark the permalink.